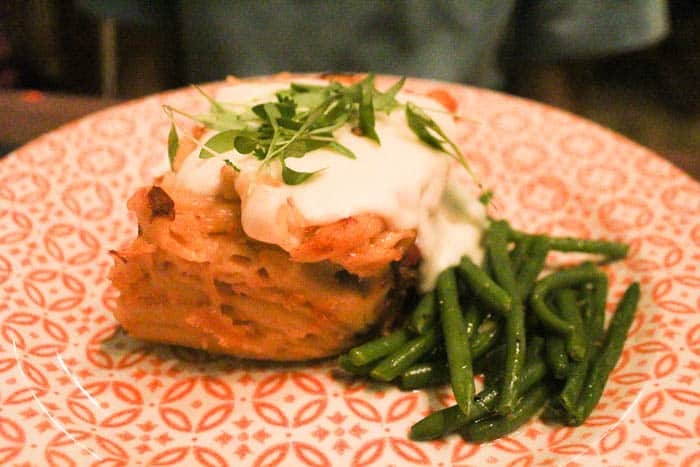 This Jungle Navigation Co. Ltd. Skipper Canteen dinner review is based on my experience when visiting the restaurant in November 2017 with my family. The Jungle Navigation Co. Ltd. Skipper Canteen restaurant in located inside Disney’s Magic Kingdom. You will find it in the Adventureland part of the park, across from the Swiss Robinson Family Tree House. They serve lunch and dinner and accept some Disney Dining Plans. I first want to apologize for the quality of the photos. This restaurant had very dim lighting and I did not want to annoy the other guests by using the flash on my camera. I would call these potstickers. 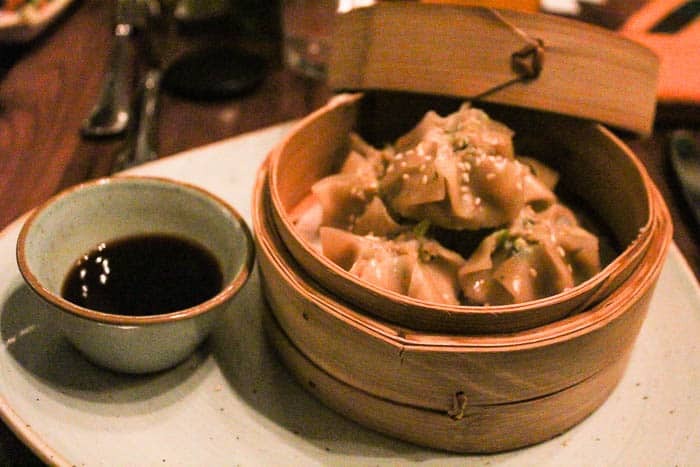 They are a combination of pork, shrimp, edamame, and spices in gyoza wrappers and served with sauce. These were delicious! I would definitely recommend them! You get a total of 5, which is a nice size for an appetizer. 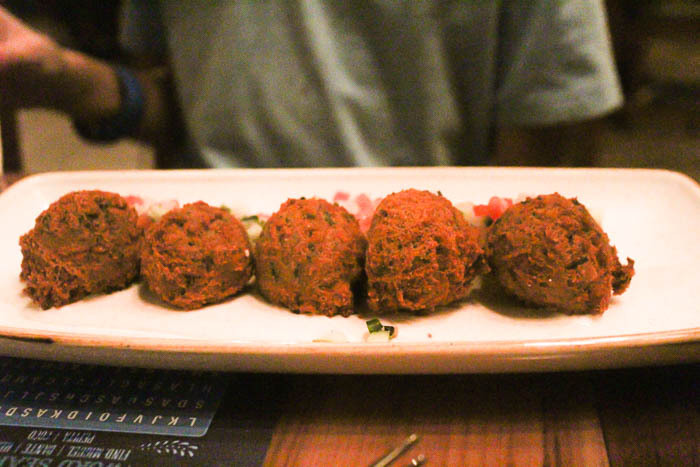 These falafel balls come served on a smear of white been puree with tomato-cucumber salad. 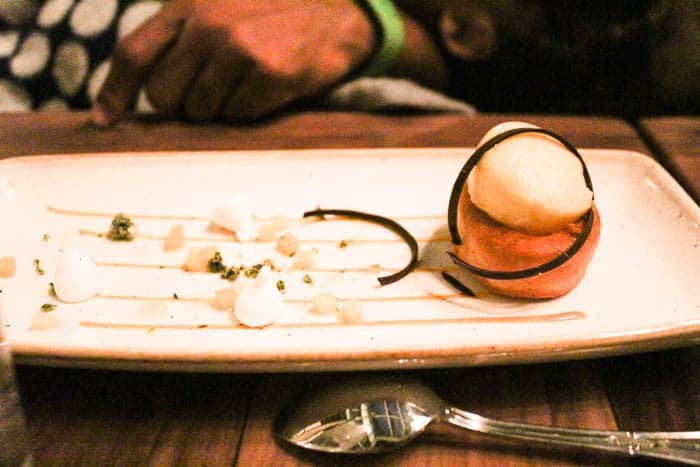 While we thoroughly enjoyed these, I really wish there was more of the white bean puree. 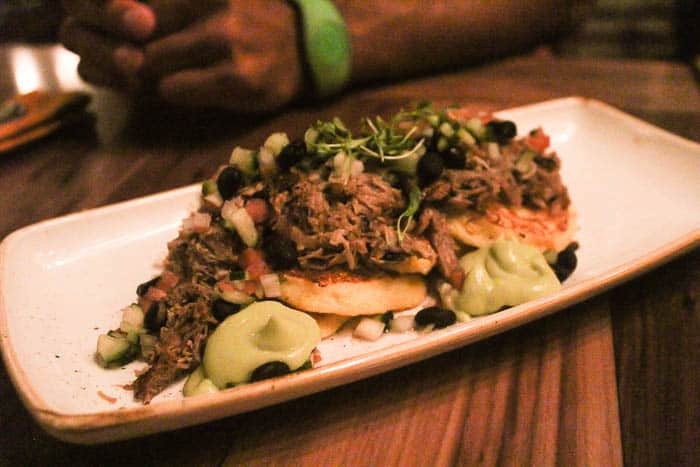 Delicious corn cakes came topped with a mojo-braised pork, black beans, and a few dollops of an avocado cream. As good as the other two appetizers were, this one was my favorite! I had to look up the description for this one! When I ordered it, I wasn’t quite sure what everything was and just hoped I would like it. It’s described as a churrasco-marinated New York strip steak. 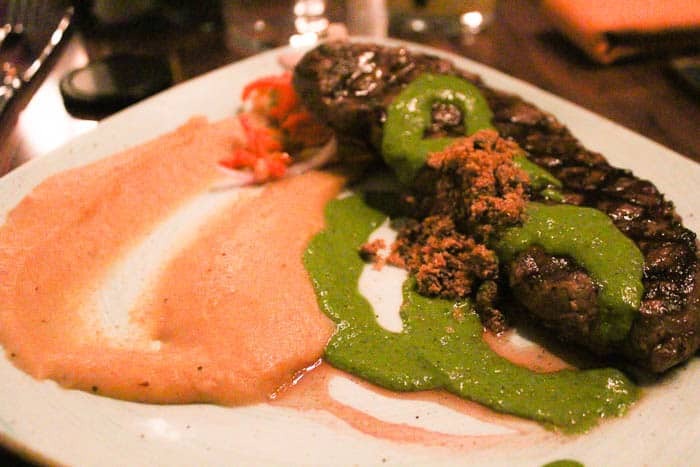 It’s served with mashed plantains and toasted Brazil nut-pesto topped with farofa. I’m still not sure what “churrasco” really is, but I think in this recipe they are referring to chimichurri. Farofa is a toasted cassava flour and kind of resembled light bread crumbs. The steak was amazing. I found the plantains to be a little too sweet for my liking, but that still didn’t stop me from eating every last bite of them! To my surprise, my fiancé ordered the Nile Nellie’s Noodle Bowl. This from a man who claims that soup isn’t real food and eats 3-4 times the amount I do. 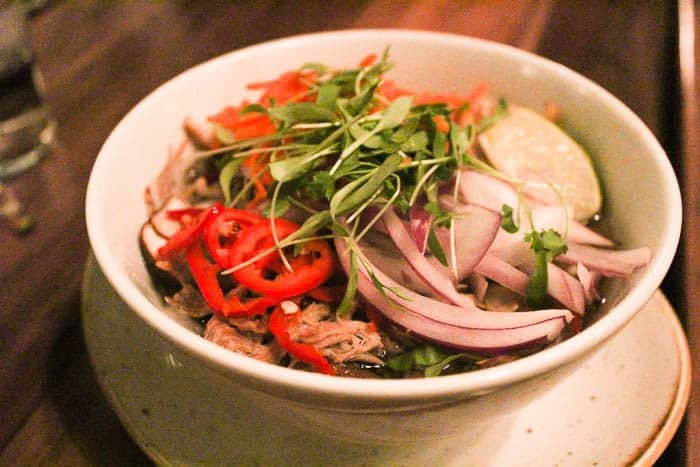 This noodle bowl comes with chicken or duck, jalapenos, and fresh herbs. He enjoyed it and I think that along with the appetizers, it was a plenty filling meal for him. Poor Jaxon. I think ordering off the “grown-up” menu was challenging for him at times. He’s not usually one to enjoy pasta dishes, so I’m not sure why he chose one for his dinner this night. I suppose, he just didn’t want to try anything else and didn’t really understand the description. This entree is an Egyptian-inspired dish. In almost looked like lasagna with beef, pasta, and a bechamel sauce. It came with a side of vegetables. I strayed from my comfort zone a bit with this choice. I almost always go for the chocolate dessert, but I’ve really been loving coconut lately. This is a slice of vanilla chiffon cake covered with coconut and lime-white chocolate ganache. There was also bits of the pineapple basil compote with some fun chocolate shavings and a little purple flower on top. The pineapple basil compote wasn’t my favorite, but the rest was delicious. I also like that the desserts aren’t huge. We were literally so full after each meal! This dessert was fun to order! It’s also a vanilla chiffon cake but it’s flavored with a lemon grass-ginger syrup and served with mango-lime sorbet. My fiance will almost always order ice cream or sorbet for dessert! He said that the cake was good, but that the sorbet was really delicious. Once dessert came, Jaxon was happy again. If I don’t order the chocolate dessert on the menu, I can definitely count on my son to! Kungaloosh! is a chocolate cake that comes with caramelized bananas. 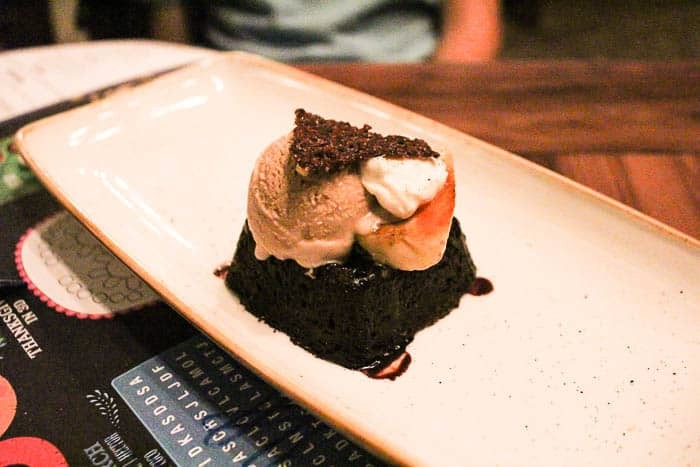 It’s served with cashew-caramel ice cream topped with coffee dust. The only part he didn’t like was the crispy little decoration on top. As with all of our meals in Disney, we were very happy! 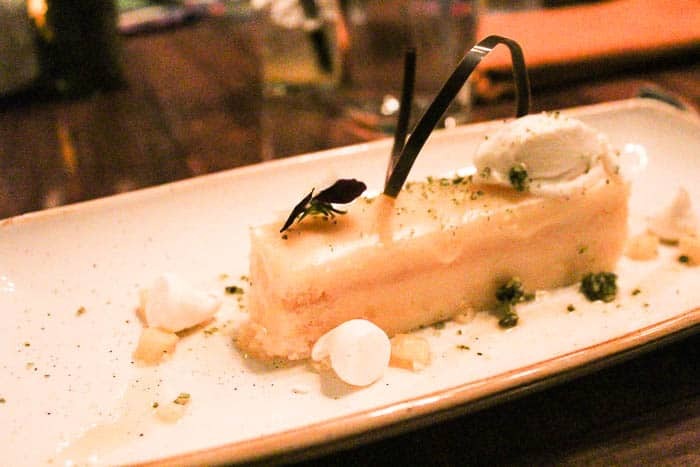 Because the menus are always changing, I can’t guarantee the same selections will all be available as in this Jungle Navigation Co. Ltd. Skipper Canteen Dinner Review. To see the current menu and prices, click here!